Jamie wanted "an opportunity to grow and mature, save money, and decide what to study." This came easy for her as she enrolled at Sauk Valley Community College after graduating from high school. During her time at Sauk, she had the opportunity to work for the college's switchboard as a workstudy, allowing her to make connections with staff and faculty. Besides the networking around the campus, Jamie wanted to help inform the community about opportunities at Sauk. She applied, and became an SVCC student ambassador. This was her first true experience with her future career and passion, marketing and public relations. After graduating in 2001, Jamie transferred to Illinois State University and earned a degree in public relations. Shortly after graduation, she accepted a position with a marketing firm in Bloomington, Illinois, and worked with a variety of businesses in the central Illinois area with marketing needs. Following her time at the firm, she took a job at the corporate headquarters of COUNTRY Financial in corporate communications to develop communications for employees and financial representatives. Soon, ISU called her name and she returned there in 2010 as the Assistant Director of Marketing for University Housing Services. Here, she worked with websites, social media, special events, branding, and assessment efforts. After three years, she moved to ISU's campus dining department as the marketing and assessment coordinator. Jamie also became involved as a member of the Bloomington/Normal chapter of the Association for Women in Communications, and served in a number of roles including president. In 2010 she was named Chapter Member of the Year. Recently, Jamie was named director of donor relations and stewardship at lllinois State University. In this role, she oversees a comprehensive donor stewardship program, engaging and cultivating university donors and prospects at all levels of giving. 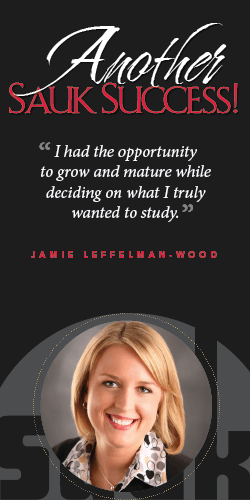 With her success in her career and life, Jamie believes it started with Sauk. She stated, "Sauk provided a solid foundation for my higher education. I was able to affordably earn my Gen Ed requirements and felt extremely prepared transferring to a four-year university. It was intimidating to choose classes and apply for financial aid, but I always found there was someone readily available to help with those processes too."